Our Wisconsin cedar roof cleaning service specializes in the safe and gentle soft wash process. Soft washing is the only way recommended to clean cedar shake roofs! Cedar shake roofs should never be power washed or walked on to be cleaned. That method is damaging to the cedar because of the water pressure and the person walking on the roof will break the shakes. Unlike power washing, soft washing kills the organisms growing on the cedar shakes and keeps the roof cleaner much longer. Power washing will not kill brown rot fungi, moss or lichen but soft washing will. 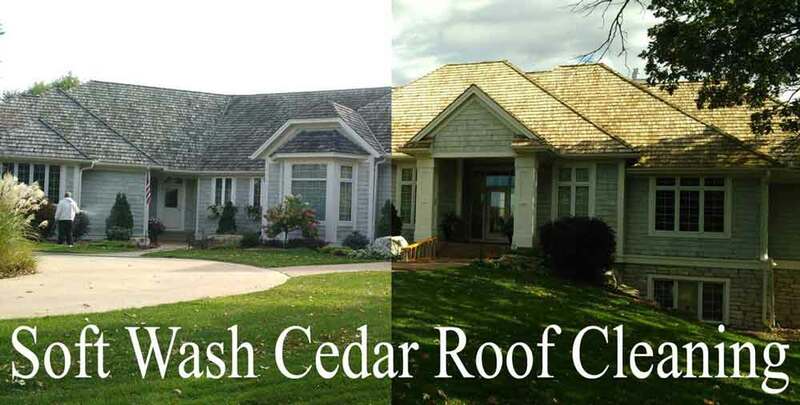 Our Wisconsin cedar roof cleaning service will make your cedar shake roof look new again, guaranteed! Contact us or give us a call or text at 612-919-4185 to learn more about our Wisconsin cedar roof cleaning service. If your roof is looking black or green we can get it Absolutely Clean! Even-though we are a MN based company we travel nationwide to clean cedar roofs! We do not subcontract and the owner himself will be on every WI cedar roof cleaning job. We want our Wisconsin cedar roof cleaning service to be very transparent. We feel that being very visual with pictures and videos is a good business practice! We pride our business on integrity, honesty and transparency and of course customer satisfaction. Please enjoy the videos below and more roof cleaning videos on our YouTube channel. We have more videos on roof cleaning that any company we know of. Algoma, Allouez, Altoona, Amery, Antigo, Appleton, Arcadia, Ashland, Ashwaubenon, Baldwin, Baraboo, Barron, Bayside, Bellevue, Beloit, Berlin, Beaver Dam, Black River Falls, Bloomer, Boscobel, Brillion, Bristol, Brodhead, Brookfield, Brown Deer, Burlington, Caledonia, Cedarburg, Chilton, Chippewa Falls, Clintonville, Columbus, Combined Locks, Cottage Grove, Cross Plains, Cudahy, Cumberland, DeForest, Delafield, Delavan, De Pere, Dodgeville, East Troy, Eau Claire, Edgerton, Ellsworth, Elkhorn, Elm Grove, Evansville, Fitchburg, Fond du Lac, Fort Atkinson, Fox Point, Franklin, Genoa, Germantown, Glendale, Grafton, Green Bay, Greendale, Greenfield, Hales Corners, Hartford, Hartland, Hayward, Hobart, Holmen, Horicon, Hortonville, Howard, Howards Grove, Hudson, Jackson, Janesville, Jefferson, Johnson Creek, Juneau, Kaukauna, Kenosha, Kewaskum, Kewaunee, Kiel, Kimberly, Kronenwetter, La Crosse, Ladysmith, Lake Delton, Lake Geneva, Lake Hallie, Lake Mills, Lancaster, Little Chute, Lodi, Luxemburg, Madison, Manitowoc, Marinette, Marshall, Marshfield, Mauston, Mayville, McFarland, Medford, Menasha, Menomonee Falls, Menomonie, Mequon, Merrill, Merton, Middleton, Milton, Milwaukee, Mondovi, Monona, Monroe, Mosinee, Mount Horeb, Mount Pleasant, Mukwonago, Muskego, Neenah, Nekoosa, New Berlin, New Holstein, New Libson, New London, New Richmond, North Fond du Lac, North Hudson, Oak Creek, Oconomowoc, Oconto, Oconto Falls, Omro, Onalaska, Oostburg, Oregon, Osceola, Oshkosh, Paddock, Peshtigo, Pewaukee, Platteville, Pleasant Prairie, Plover, Plymouth, Port Washington, Portage, Poynette, Prairie du Chien, Prairie du Sac, Prescott, Pulaski, Racine, Reedsburg, Rhinelander, Rice Lake, Richfield, Richland Center, Ripon, River Falls, River Hills, Rochester, Rothschild, Sauk City, Saukville, Seymor, Shawano, Sheboygan, Sheboygan Falls, Sherwood, Shorewood, Shorewood Hills, Slinger, Somerset, South Milwaukee, Sparta, Spring Green, Spooner, St. Croix Falls, St. Francis, Stanely, Stevens Point, Stoughton, Sturgeon Bay, Sturtevant, Suamico, Sun Prairie, Superior, Sussex, Thiensville, Tomah, Tomahawk, Twin Lakes, Two Rivers, Union Grove, Verona, Viroqua, Wales, Walworth, Waterford, Waterloo, Watertown, Waukesha, Waunakee, Waupaca, Waupun, Wausau, Wauwatosa, West Allis, West Bend, West Milwaukee, West Salem, Weston, Whitefish Bay, Whitewater, Williams Bay, Wisconsin Dells, Wisconsin Rapids, and Wrightstown WI.